Source Serif Pro is a serif typeface created by Frank Grießhammer for Adobe Systems. It is the third open-source font family from Adobe, distributed under the SIL Open Font License. The typeface is inspired by the forms of Pierre Simon Fournier and is a complementary design to the Source Sans family. It is available in six weights (Regular, ExtraLight, Light, Semibold, Bold, Black) in upright styles and italics to complement them. 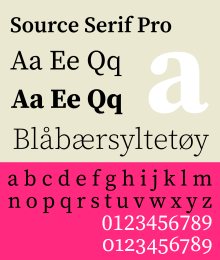 The first version of Source Serif Pro was released in 2014. Version 2.0 was released in 2017 and introduced support for more Latin characters, Cyrillic, and Greek. In 2018, italics were added in version "2.007R-ro/1.007R-it". Source Sans Pro, the first member of Adobe's open-source family. Source Code Pro, the second member of Adobe's open-source family. Source Serif Pro, the third member of Adobe's open-source family. Source Han Sans, the fourth member of Adobe's open-source family and the first to include CJK characters. Source Han Serif, the last member of Adobe's open-source family and includes CJK characters. ^ Miñoza, Nicole (20 May 2014). "Introducing Source Serif: A new open source typeface from Adobe". Adobe Typekit Blog. Adobe Systems Incorporated. Retrieved 31 January 2015. ^ Crossgrove, Carl (19 March 2015). "Source Serif". Typographica. Retrieved 11 February 2017. ^ a b Grießhammer, Frank (10 January 2017). "Introducing Source Serif 2.0". Adobe Typekit Blog. Adobe Systems Incorporated. Retrieved 11 February 2017. ^ Grießhammer, Frank (16 August 2018). "Source Serif Italics are here!". Adobe Typekit Blog. Adobe Systems Incorporated. Retrieved 16 August 2018. This page was last edited on 4 December 2018, at 23:53 (UTC).